No, not THAT quilt show, the Red & White one in New York, I went to the the 31st Annual Quilt Fest sponsored by the Decatur Illinois Quilters Guild. 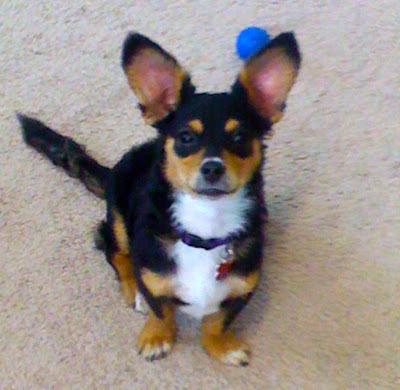 "He's so cute! The name that popped to my mind was Tucker. Don't know why, it just did. 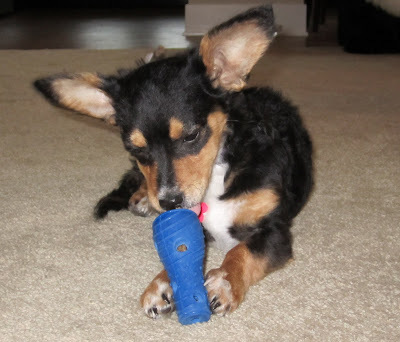 Over the years we have had Tuffy, Freckles, Blondie, Lovey, and Pistol Pete." All the names were great, but in the end my daughter just thought he looked like a Tucker!! A check for $76 is in the mail to the Dogs Without Borders rescue group of Los Angeles County because you took the time to leave a suggestion, thanks so much!! Here are a few pictures I took at the Decatur Quilt show. I'm always amazed when I get home and look at my pictures, or lack of pictures. I guess I get distracted, I never take enough pictures! 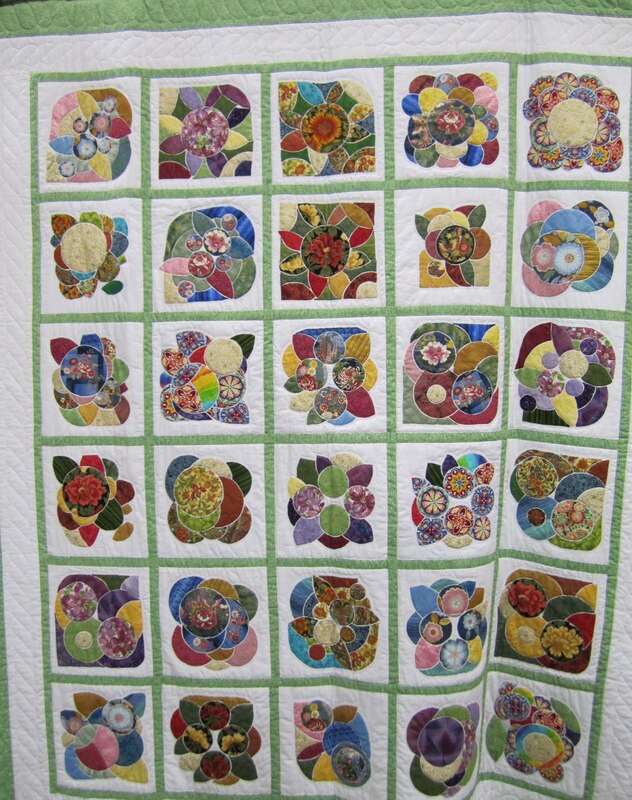 This quilt was perfectly pieced and the quilting amazing. Every one of those diamonds has a little quilting design in it. 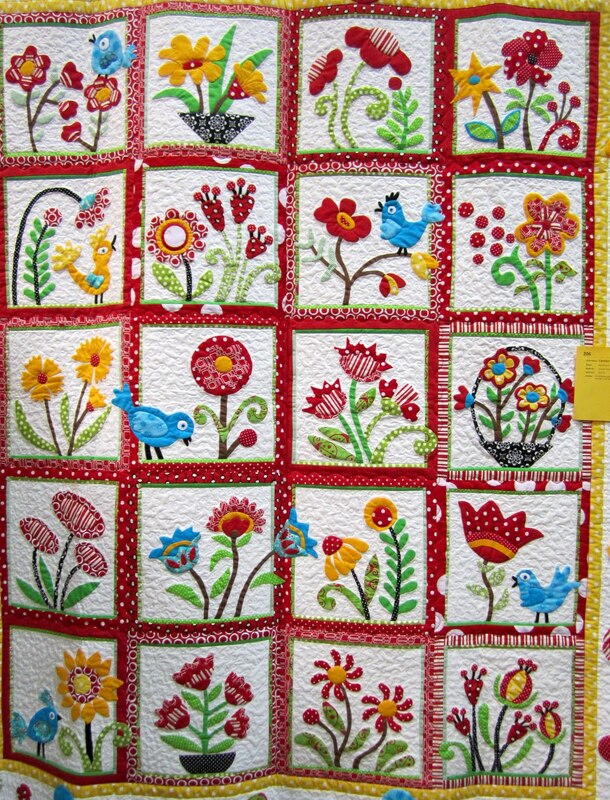 I took a bigger interest in the applique quilts this year. I've always enjoyed looking at applique quilts, but now that I'm doing applique, I have a whole different regard for them, a better appreciation for the work, the time and the effort that is put into each quilt. This is a mosaic pattern. Very unusual, and the first time I had seen anything like it. 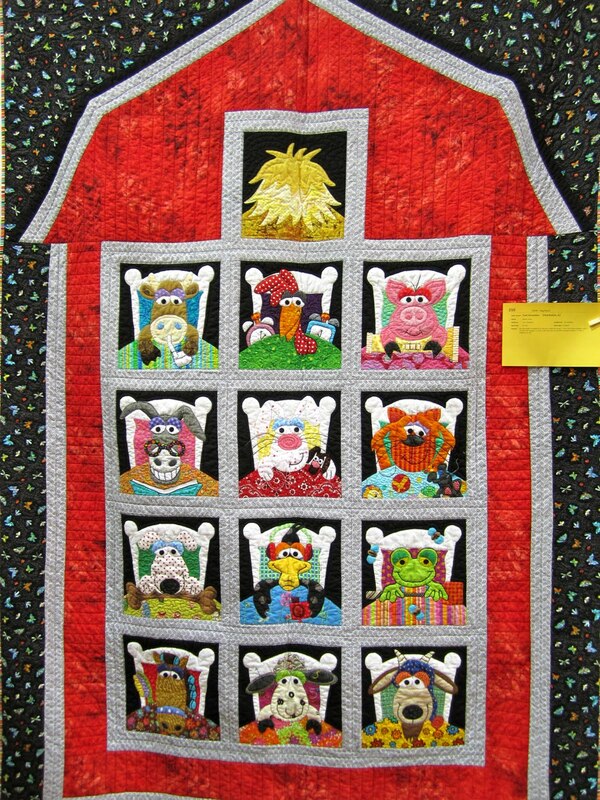 I heard this quilt took a first in its division. Here's a close up of one block. While the mosaic one was interesting, I really appreciated this one. The colors and the design are more me. And that little touch of blue adds so much, I really need to get over my issue of putting (or more accurately not putting) blue in my quilts. I thought the handwork was amazing, those little circles are perfectly round! This was also an applique project that I loved. 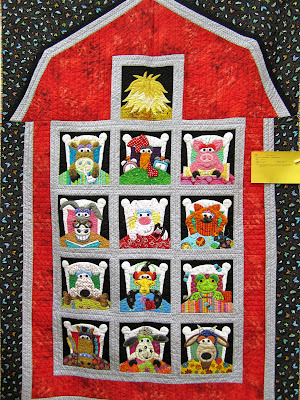 I'm not sure of the pattern name but it's a barn full of animals going to bed for the night. 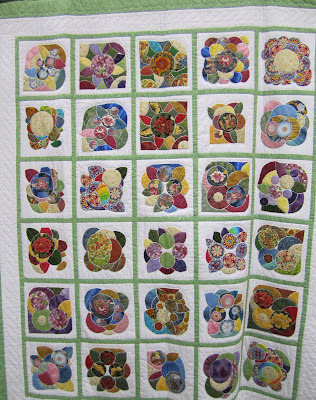 The quilt was well done and the detail was so cute. I like how the piggy is holding a flashlight, the lamb is counting sheep, and the cow is drinking its evening milk! 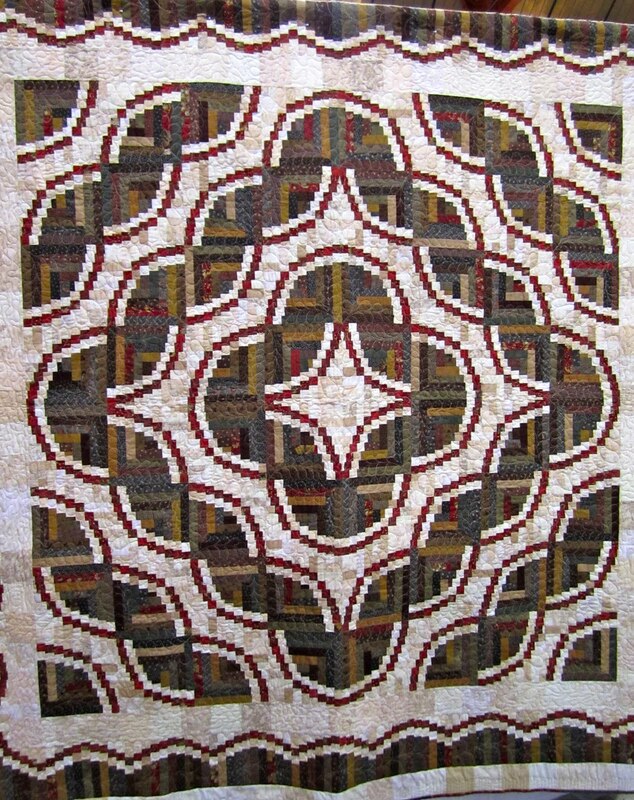 I recognized this Judy Martin pattern from her log cabin book. This was a stunning quilt. 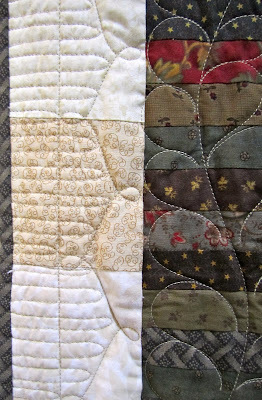 I really liked this quilting design in the border. I can't pass up taking a picture of any quilt made with Rouenneries. This is the same pattern I used for Lee's quilt, but I Thelmasized mine. That little bit of green was not part of that French General family but I think it looks great. There were vendors at the show and I stopped by a quilt shop on the way to the show and this is what I bought . . .
extra wide red ric rac! It was the first time I had seen that wide ric rac in person. It pops up online in a pattern or quilt every now and then and it always appeals to me. I have no idea what I"ll do with it, maybe put it on an apron or pillow. For now, it's just setting out in my sewing room, making me smile. 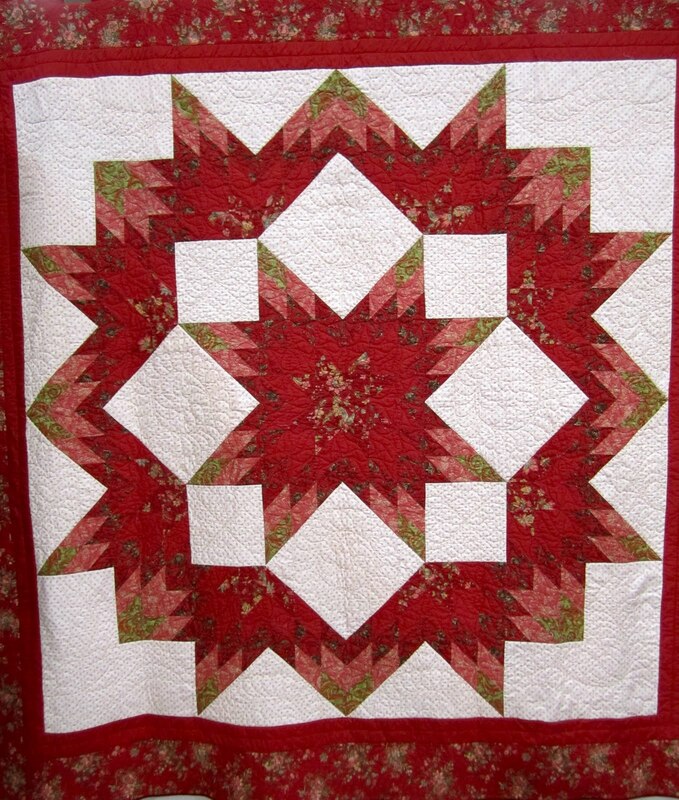 Well the Three Centuries of Red and White Quilts show officially opened in New York City on Friday. I've read a lot of pre-show information but have yet to run across any first hand accounts of the show from a quilter. I can hardly wait for those posts to start popping up. 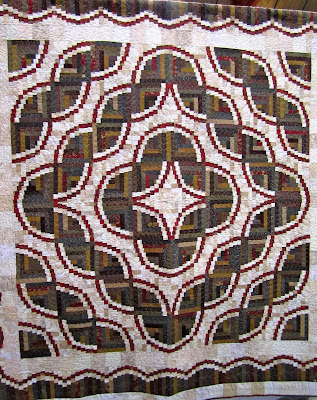 Select Lifetime Quilt #20 for more detail. 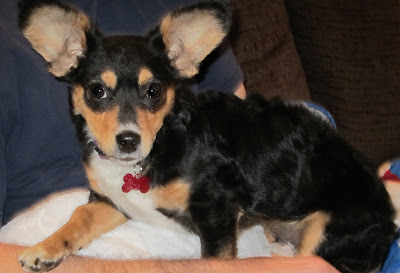 I think we may have a winner, my daughter liked several names suggested on the "Name this Dog" post, and is trying one out, so stay tuned. For sure the agency that rescued the pup is a winner, last time I checked I had 74 comments which would be a nice little donation for that organization. "Thelmasized" - The act of enlarging a Schnibbles pattern or reducing any pattern that has a 12 inch block. "Thelmafied" - The act of making minor fabric changes to a kit or BOM as to make it more appealing in appearance to Thelma. One last thing, a few posts ago I mentioned that I am a rule follower, and some folks thought that was a real funny, since I seem to be always changing up something in a pattern, but for the record, I would like to state that I think pattern directions are just like speed limit signs, they are more guidelines than actual rules. Tomorrow's the last Eventide update post before the big parade, hope you can stop back by! For the first time in 5 months I'm all caught up on my Fat Quarter Shop 2010 Designer Mystery Block of the Month using Kate Spain for Moda or as it's called in my house, "Ashley's Christmas Quilt". All caught up, with only two more blocks to go. I swapped out the fabric on the roof for the house block and I swapped out all the fabric for the present block, plus I made the box smaller to allow for a little plain border. 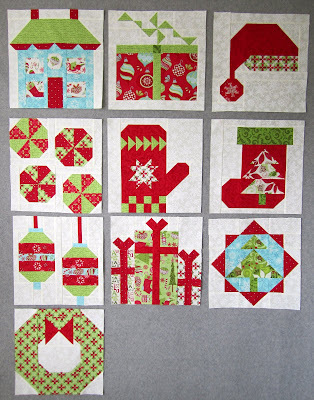 So here are all the blocks, the only block that I made exactly as called for in the pattern is the wreath, bottom left. 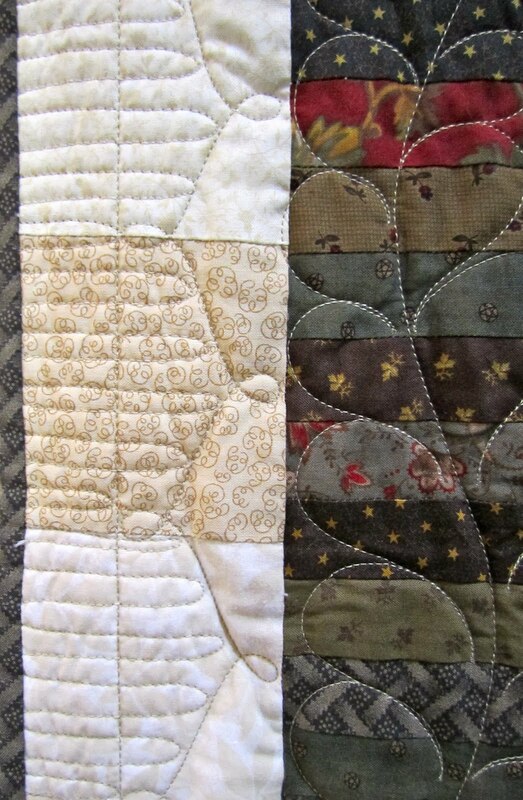 I've seen where some bloggers have already added the sashing to their completed blocks, and being the organized, stay ahead of the game, efficient person that I am, I think that's a very clever idea. But how can I come up with the perfect placement of every block until I have every block!! 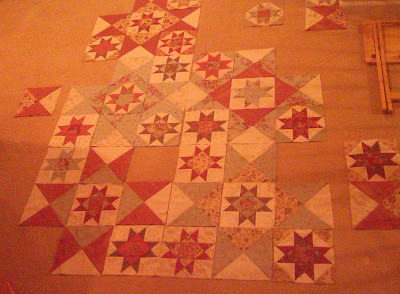 Believe me, if I had all those blocks connected, and got the last block, and thought it would look better in the middle of that quilt, I would take it all apart to put that block in the middle, so I'm forcing myself to wait until I have that last block done before I start sewing them all together. Dog Name Update - I'm glad I'm not the one deciding that dog's name, you have made some great suggestions, thanks so much. As soon as my daughter has decided on a name, I'll be sure to let you know! and you know what that means . . . It's Eventide Update Day!! First up, my progress . . . . 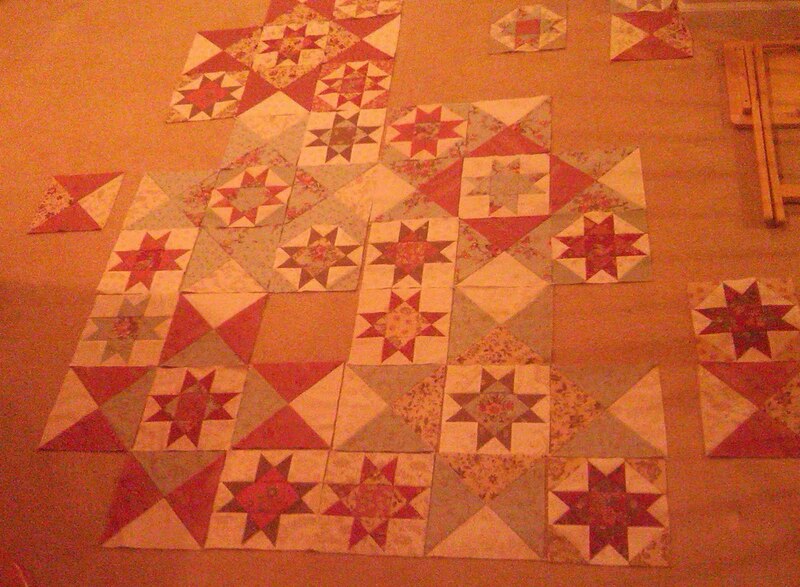 Here's the center of my project, all laid out on my living room floor. I sure struggled with the perfect combination and placement of those blue star points, but I could not be happier with how it's all coming together. 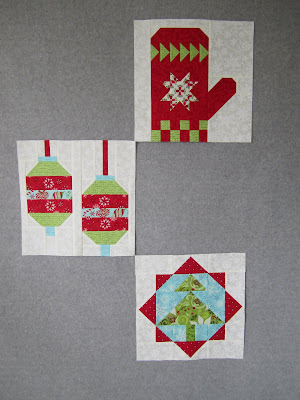 Next, creating those hour glass blocks for the inner border. 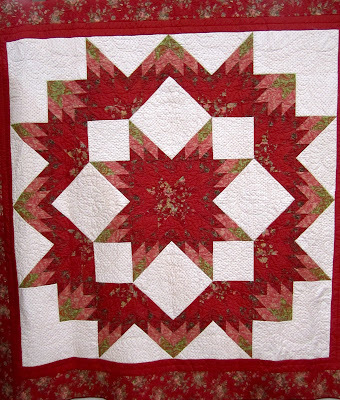 When Carrie talked about this quilt at class, she mentioned that when she was making her hour glass units for the inner border, she thought the solid red alone looked too bold, so she made her units using two different reds, a red solid and red floral print. This is a closeup of Carrie's inner border. one plain red, one floral. Here's Deb's latest picture of her progress. 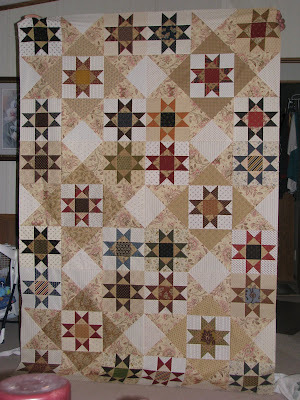 Deb says, " I've got the center of the quilt completed and I'm loving it! I've got all of the Ohio Stars, and larger pieces completed - just working on the inner and outer borders now. I'm beginning to see the end in sight now. 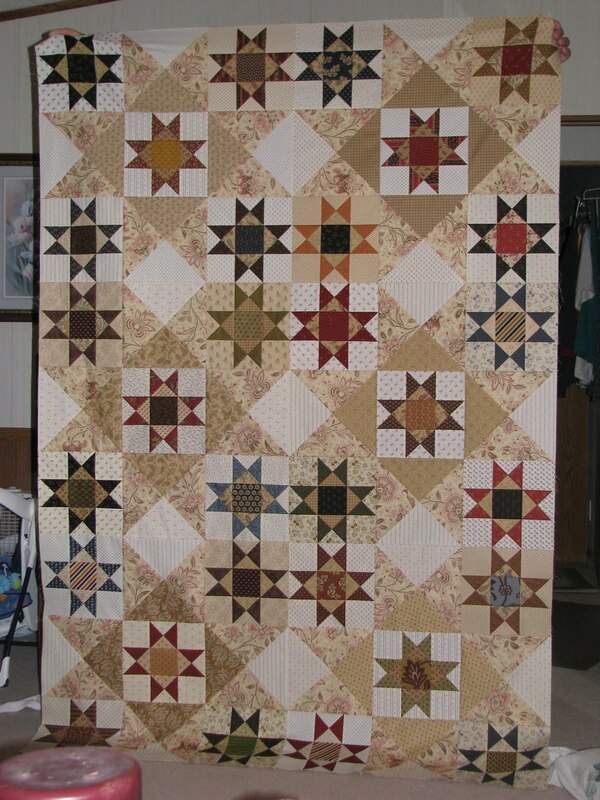 Deb, I just love the pop of color from your Ohio Star blocks, they look great with your large Ohio Star fabrics. 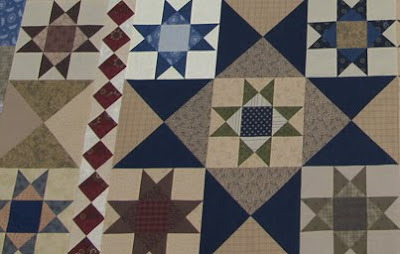 Mary Lou started working on Eventide from a newly organized sewing room plus her chicks came, but she still managed to finished all her large quarter square triangles and start on the Ohio Star blocks. Mary Lou has also had the added distraction of a husband home on leave, but he's back in Afghanistan now, thanks Mary Lou to you and your husband for the sacrifices you are making for us all. Bea has completed the center of her quilt and is also working on her inner border units. Becky has the most beautiful stack of French General fabric just waiting to be cut and pieced. 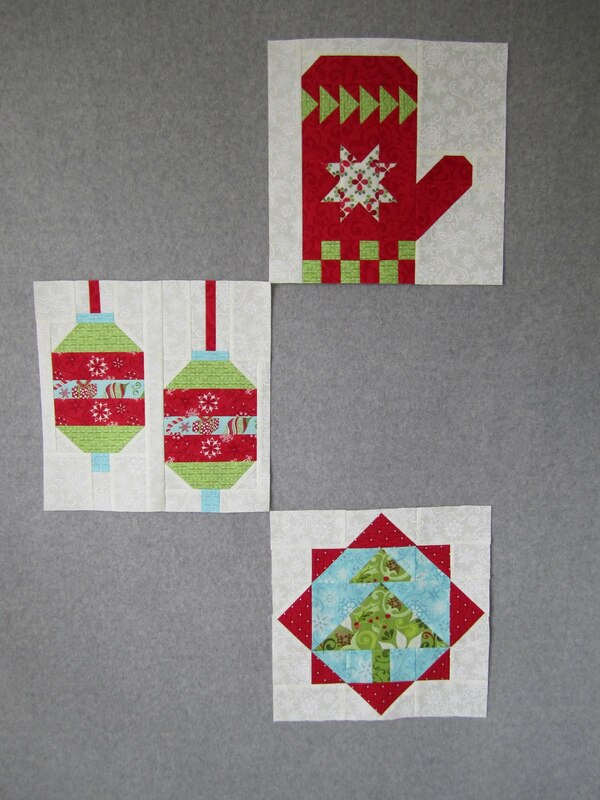 Carol only has 8 more Ohio Star blocks to go. 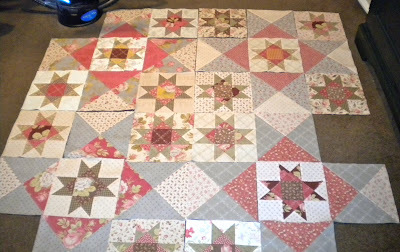 Gretchen has all her center Ohio Star blocks pieced, hang in there Gretchen, I think you'll make the deadline with time to spare! 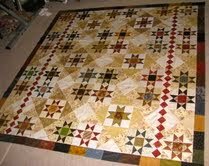 Judith has the center portion of her project all pieced too! Nicole's been squeezing in a little time on her Eventide, when she's not been making baby girl onesies, burb clothes, and quilts. Paula's got a good jump on the pieces of her Ohio Star blocks and a bad case of pneumonia, take care Paula, you still have plenty of time before the parade. Sharrieboberry's on spring break with her family,have fun and we'll catch you next week! 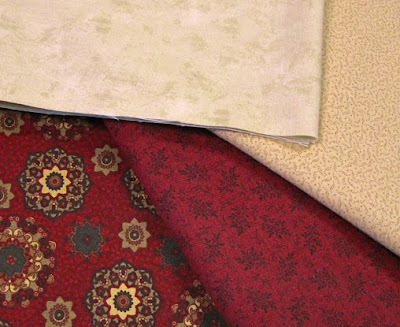 Shelley's gotten her pattern, her fabric and decided on her color scheme, I think that's the hardest part of the project, it's smooth sailing for you now Shelley. Sherri's using the same fabric combination that I'm using, except she's swapping the blue for gray. 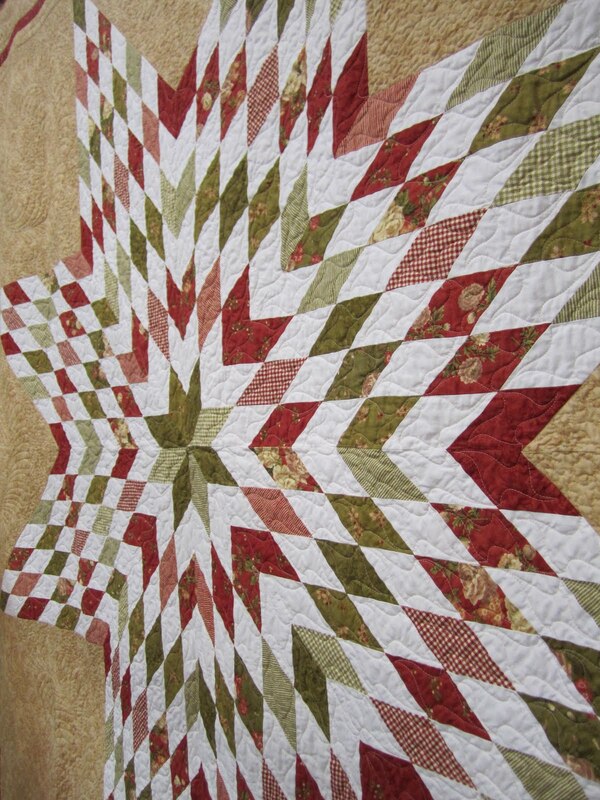 Sinta's been working real hard on the perfect combination for her large Ohio Stars, but I think she's finally got it! Linda just got her pattern and will be starting her project soon, she's selected Remembrance by Brannock and Patek. Deb, you're this week's sew along winner and you've won them all! Would you like to win Carrie's 6 new Schnibbles new patterns, just leave a comment on this post by midnight, CST, Wednesday, March 16th. The patterns should be arriving at the Fat Quarter Shop any day now. 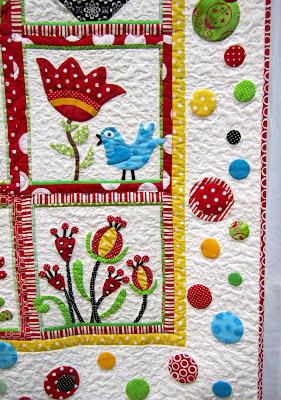 Last week's comment winner of any layer cake from the Fat Quarter Shop is Jackie, of Jackie's Stitches. 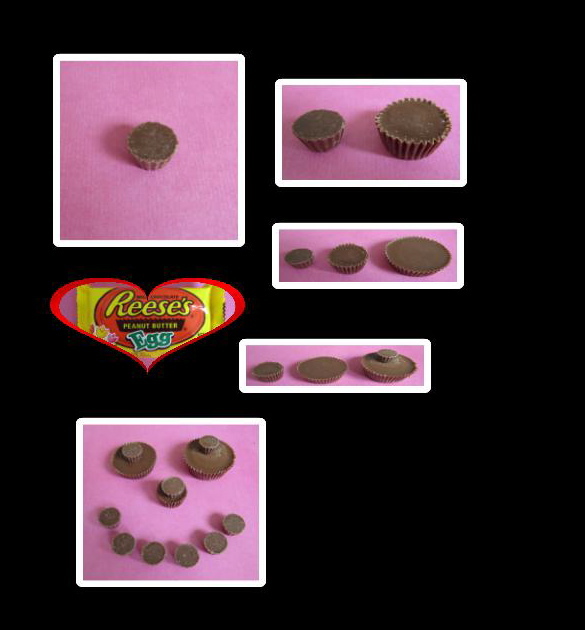 Congratulations Jackie, thanks for following our sew along. Drop me a note with your choice of layer cake. 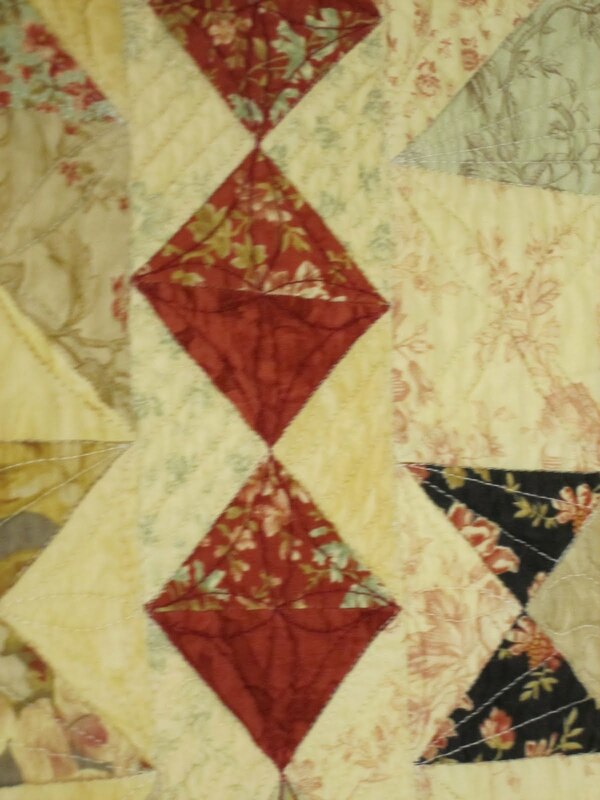 Sue, our first Eventide finisher, would like to pass her pattern on to a lucky quilter who has not yet purchased it, if you're the first person to leave a comment asking for it, it's yours. Thanks Sue! 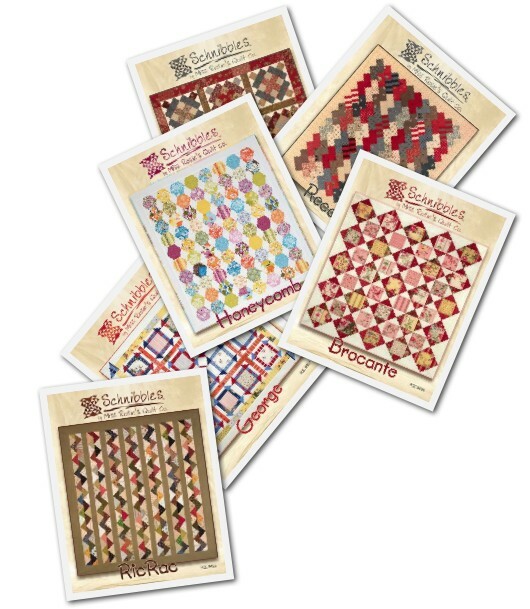 Sandy was the first to comment and has nabbed Sue's Eventide pattern! And finally, as always, if I missed your update this week, I'll add it next week, PLUS it's not too late to join!